Raising the flag of True Metal you say? Well, not quite but there were others that did that job already anyway. The golden years of Traditional Metal in the USA, the mid 80s, times of greatness and heaviness, assimilating the British vibe into an iconic monster that swept away the American Metalheads in its own bloody good version. In accordance, a swarm of bands emerged to spread its own variety of the sacred music. X-CALIBER, originated in Irwin, Pennsylvania, made their stance possible for three whole years, tried to find a leeway in a giant market, having some small victories on the way. One of those victories were a debut, and their only, album named “Warriors Of The Night”, which was released independently back in 1986. Heaven And Hell Records did the band a service and reissued the album just a little while ago, letting the contemporary believers have their feast on something that might be old, yet with a few ideas of how it was back then. “Warriors Of The Night” displayed a band converging mostly around the emotive motifs. Though there is the sort of warrior / macho like figure, the band gave little attention to the epics of Metal, and chose rather to touch hearts through “could have been” radio friendlies but with some cajones. The music takes various examples from DOKKEN / GREAT WHITE / early MOTLEY CRUE / CIRITH UNGOL and several early 80s British Metal elements. Essentially, this album may be referred as fine mixture of blue collar Hard Rock or Heavier AOR with a few Metal shout outs. In overall, a rather interesting to be honest, and seems to be quite assorted. Furthermore, it is also a must to mention the stellar lead guitar section that flamed with fiery soloing. However, the passion and enthusiasm both started and ended with those solos. Whether it is the general texture of the songs, overall atmosphere that prolonged through the album, or in particular the vocals, the album feels somewhat foggy. 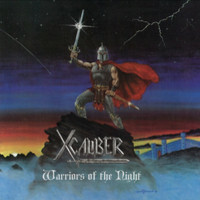 I had, and still do, been listening to a lot of 80s Metal albums of the X-CALIBER’s kind, and the minority lack the burning flame. It is evident that the band hit the riffs right, writing some catchy stuff that sounded good, yet their front appeared burned out in a way, not letting its listeners enjoy its full capabilities and potential. Therefore, I ask, where is the bloody juice, where is the octane and the flair? Probably came afterwards but it was too late. Furthermore, and I can’t consider this as a joke, but one cannot brag about mistakes in playing, it has to be re-recorded and not proclaim that it was on purpose. Even if under the weather, “Warriors Of The Night” holds a few songs that I consider as gems: The epic fighter “The Sword”, the sensitive yet heavy “Tell Me Why” and the closer to energized “Rock’s Alive”. You have here a collector’s item from a band that faded away pretty fast. It might not be an unforgettable piece yet still holds a certain value.